Hailing from Atlanta, Mastodon are a band who seem to delight in being different. Trying to decribe their music is a challenge in itself - is it Prog metal, Thrash metal, Hard Rock, Stoner rock or something else? The best answer is that it's a unique blend of all of these musical genres - certainly Prog Metal is the best fit but even that is an inadequate desscription. 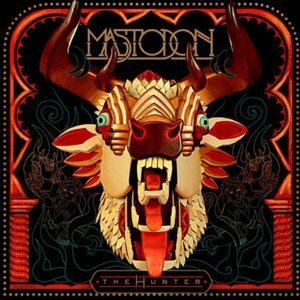 If you've never heard anything by Mastodon before then you've defintely missed out - their music is some of the heaviest Prog metal you'll hear anywhere. "The Hunter" is the band's fifth album, and the first since their critically acclaimed album "Crack the skye". There are none of the epically long songs that we've seen on previous albums - several of which have featured songs over 10 minutes long, and I think that does help make the album more accessible. "Creature lives" stands out from the rest of the album. The introduction is quite bizarre and really sounds like something you'd get from Pink Floyd. The song itself is also totally different to anything else on the album, and if you heard this track by itself you'd struggle to guess who it was. There is an undercurrent of heavy guitars there but the song isnt anywhere near as heavy as the rest of the album. Its a good song though, just one that might take fans a while to get used to. The rest of the album is a more consistent prog style, but there is plenty of variety between songs to keep people interested. The album include some quite bizarre song titles "Bedazzled finger nails" and "Octopus has no friends" for example. The album is certainly great value for money - 13 tracks and 53 minutes of music of a consistently high standard is better than you'll find on a lot of albums these days. This is an album that in my opinion surpasses their previous best work, "Crack the skye". Mastodon's fans are going to love this album.